I mentioned in a previous post about Frederick Wertham debating Al Capp on The Author Meets The Critics that Wertham appeared also on another episode… I recently listened to it. You can do so here. Wertham gets completely destroyed in the debate by Edwin J. Lucas, who makes good use of Wertham’s own words in discrediting him. As stupid as Wertham sounds, he is joined by another even less coherent person apparently also making a career out of disparaging funny books, a miss Virginia Peterson… she does a lot to make his case even weaker. In spite of being squarely on his side in the debate, I disagree with the fundamental argument Mr. Lucas makes, though. Personally, I am a first amendment extremist… but I no longer buy the argument that is often made by other first amendment extremists that a reader’s behavior is not affected by media that they intake. To claim that a child is always unaffected behaviorally by a violent image unless they were previously maladjusted seems deeply disingenuous. Few would argue that a child can not be positively influenced by media (after all, textbooks are media, right? )… so why wouldn’t they be able to be negatively influenced by it? The real issue… which, strangely, no one seemed to be arguing at the time… is that artists and writers should be able to make any sort of art they damn well please without having to cater to censors or worry about what effect it will have on their readers. Their job is to make the art, not to worry about what effect it will have. If the media consumers do not like something they read, watch or listen to, they can choose not to read, watch or listen to it. If they are children, their parents should be taking responsibility for what media they are exposed to. Obviously, no parent can monitor everything that a child sees… nor should they attempt to. But to censor media out of concern that children could potentially be exposed to it is reprehensible, as it comes at an enormous cost to freedom of expression. This cost of this sort of censorship can be easily evidenced by reading a sampling of comics made before and after the comics code was implemented. Before the code, there were many vibrant and entertaining comics… after the code entertaining comics were few and far-between. Readership plummeted. The art form was effectively neutered for years until the underground comics brought it back from the dead with a vengeance… and that was for a comparatively microscopic audience. The effect of the censorship is still felt… comics have not sold in anywhere near the same numbers as they did before the code to this day. In the mid-fifties, Walt Disney’s Comics and Stories had a monthly circulation of over three million copies. Almost every kid read comics… needless to say, literacy rates were much higher. Now 100,000 copies sold of a comic book is considered wildly successful. While obviously censorship is not the only reason for this, I would guess it may be one of the biggest ones. Tom Spurgeon linked to this interesting interview with Frederic Wertham and Al Capp from an old radio show called The Author Meets The Critics on his Comics Reporter blog the other week. I got around to listening to it today. It was recorded when Capp was at the height of his popularity in the fifties, and the focus of the discussion is largely on the Schmoo. Capp decimates Wertham, but you kind of end up wishing he used better arguments. Capp is ill-informed about what is in the comics on the newsstands, and is under the impression that the majority of comics published at the time are reprints of newspaper comics, which was not the case (as Wertham correctly states). Capp believes the comics have all been thoroughly censored (since in his mind, they are reprints of comic strips, which he knows are thoroughly censored)… which, strangely, Capp seems to have little problem with, or if he does he does not elaborate on it. Wertham makes much more inaccurate, spurious and poorly articulated arguments, though… hearing him talk, it is actually hard to believe anyone could have ever taken him seriously. Must have been the accent. I just noticed that wasn’t the only episode of The Author Meets The Critics Wertham appeared on either… I haven’t listened to it yet, but here is another one. There are many more old-time-radio shows on that site as well… it appears to be quite a treasure trove. View the Frederic Wertham Memorial Funnybook Library here. HEY! KIDS! COMICS! Wertham Memorial Funnybook Collection Update #1: Read Seduction of the Innocent Online! Thanks to Sinous on the Comics Journal message board, the biggest omission to the Wertham Library has been found. He points us to two different locations on the web that you can read Dr. Wertham’s Seduction of the Innocent… here and here. This week was Banned Books Week. I decided to celebrate by seeing how many of the comics featured in Fredric Wertham‘s notorious book Seduction of the Innocent I could find floating out on the internet to share with the world in one convenient location. 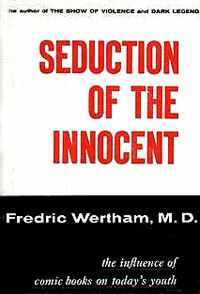 Wertham’s writings on comic books were very influential in the senatorial investigation into juvenile delinquency in 1953, and Seduction of the Innocent went on to become a best-seller, outraging parents across the nation. GO HERE TO READ MORE, AND TO DOWNLOAD THE COMICS. The Jack Kirby Museum brings us the fascinating post “The Most Poorly Reworked Story in the History of Comics,” an examination of the differences in one story published before and after the censorious Comics Code was implemented. Click the above image to go there. Pulped Fiction: The Drunken Abusive Superman!